Can courts stop the GOP's assault on the powers of Wisconsin's incoming Democratic officials? Analysis: The "separation of powers" doctrine may not protect the governor and attorney general from interference by legislators. The Wisconsin Senate voted this week to pass wide-reaching bills in a lame-duck session that would empower the GOP-controlled Legislature and weaken the incoming governor and attorney general, both Democrats who are replacing Republicans. The "separation of powers" doctrine, while not in the Wisconsin Constitution, is implicit in the division of powers among the judicial, legislative and executive branches, and is a foundational principle of Wisconsin's tri-partite system of government. The state Constitution creates the same three separate, coordinate branches of government that are a feature of the American federal government. No state government branch is to assert control over, or exercise the power constitutionally committed to, one of the other branches. That means the legislature in Wisconsin has a "core zone" of exclusive authority into which the executive and judicial branch may not intrude. In these core areas, any exercise of authority by the judiciary would be unconstitutional. On the other hand, the majority of governmental powers among the branches also overlap within areas of shared authority. In these areas of "shared power" one branch of government may exercise the power possessed by another branch, but only if it does not unduly burden or interfere with that other branch's power. The challenge is determining which areas are "shared" between the legislative and other branches, and which areas are core, unquestionable legislative branch powers. Democrats likely will take the position that it is the state judiciary's long-recognized duty, recognized since the U.S. Supreme Court's 1803 decision in Marbury v. Madison, to entertain a lawsuit challenging the acts of the legislature for any conflict with the Wisconsin constitution. The Wisconsin Supreme Court has adjudicated disputes about the constitutional functions of the other state government branches, notwithstanding the fact that a case involves political considerations or consequences. But a Wisconsin court reviewing the Democrats' potential challenge to the Republicans' legislative power would also have to consider whether this dispute involves a "nonjusticiable political question." If Democrats filed suit over the Wisconsin legislature's actions, the courts may invoke the "political question" doctrine to decline to adjudicate issues better left resolved by the legislative branch. If the challenged action is exclusively committed to the legislative branch,, it may be described as a "political question." This means it may be "nonjusticiable" by the courts. The rationale is this: If the courts could review and overturn everything a legislature did, then the judiciary would effectively usurp the power of another branch of government. It's hard to determine whether, in a particular case, the court should review the actions of the legislature for constitutionality, or whether it should stay out of the dispute because that issue is solely the province of the legislature. For example, Wisconsin courts have in the past considered the legislature's adherence to its own procedural rules a matter entirely within the legislature's control, and not subject to judicial review. Wisconsin courts will not invalidate a state law because of the legislature's failure to comply with its own procedural rules, so long as all constitutional requirements have been followed. 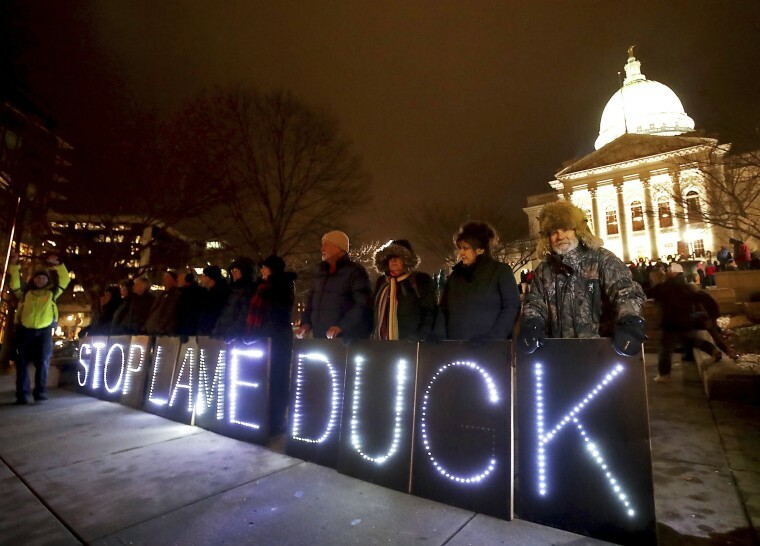 The Wisconsin Democrats' prospective legal action against the lame-duck actions of the Republican state legislature will base their challenge on a violation of separation of powers. The Republicans will likely counter with the argument that these legislative acts are one of the core powers reserved to the legislature, and therefore, the acts of the GOP lawmakers constitute a "nonjusticiable political question" — one the courts cannot review.